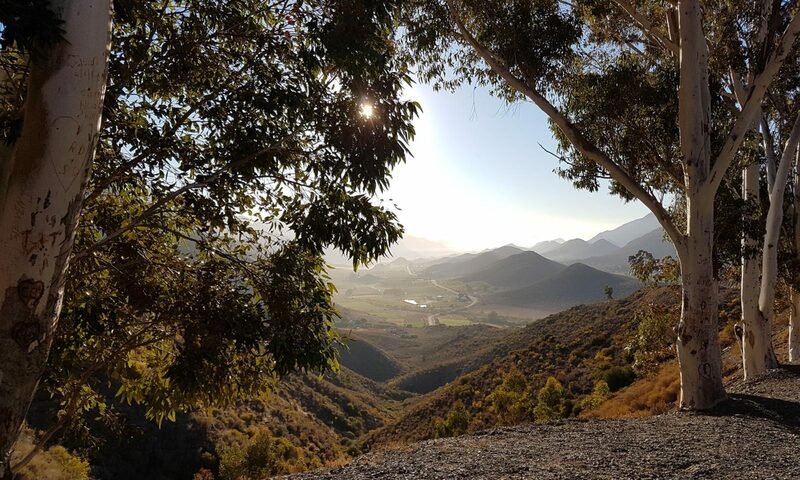 Chronologically speaking, this entry should cover the first ride of our Cape Audax Winter series which took place a couple of weekends back, especially since the actual topic of this piece references one of the outcomes of that ride. But therein lies my problem, that outcome involves two of my favorite things: a new adventure; which of course creates an excuse for a new bike. Needless to say, those thoughts have become significantly obsessive and time consuming that I need to get them down on paper … or at least digital paper anyhow. Strictly speaking – it’s not completely accurate to talk about either “new adventure” or “new bike“, but we’ll get to that just now. First up I need to explain what triggered all this – the outcome from that 200km Winter Audax. By every important measure, it was a successful return to long distance riding after the accident. But it also confirmed something that had troubled me for a few weeks – I couldn’t realistically be ready for the Natchez Trace 444 in September. There was simply no way I’d be able to ride 3.5 times the distance we’d covered at any kind of decent pace, in fact even handling the discomfort of staying on the bike for 35+ hours seemed doubtful. It was with a heavy heart that I contacted the organizers to officially withdraw from the race. Taking part in RAAM was on hold, at least for now. My mind freewheeled for a few days but, predictably, it wasn’t long before ideas for new adventures, and just as importantly the equipment to ride them with started running through my mind. Exploring those inextricably linked elements was one of the great joys I discovered during the PBP adventure – what challenges would the road throw at me, and would my preparation cope with them? The bike was a massive part of those early PBP thought processes, and it became so again. Except this time, it wasn’t really a new bike, more of an iteration of a bike I already had – Ghost. We can’t get to the bike though, without considering the adventure – because it already steered aspects of the current iteration. The 4,000km of TransContinental (TCR) places many demands on rider and machine, but two components I knew I wanted from the start were Shimano Di2 shifters, and disc brakes. As the inevitable hand palsy sets in, these help greatly with the ability to change gears and slow down. The latter of course is vital, given the likelihood of descending steep and twisting Alpine passes, quite possibly at night and in the rain. 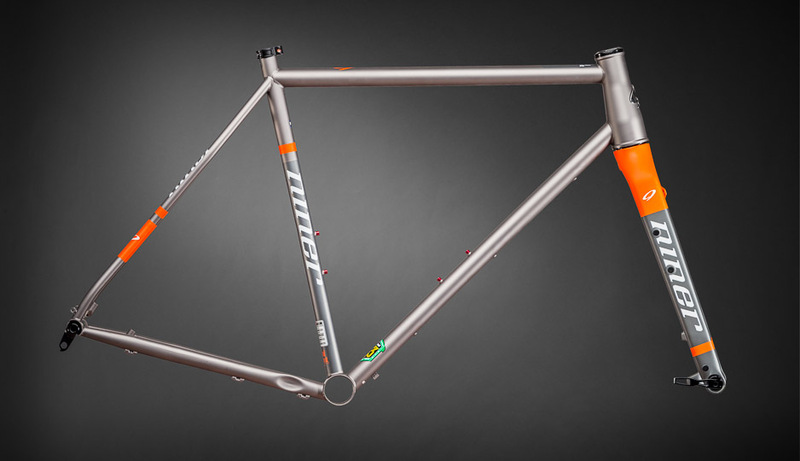 The current build of Ghost though convinced me of a couple of things: I love the Niner geometry and concept; I don’t love alloy frames for long distance comfort. For a while I contemplated piecemeal solutions to help with that – seatposts with springs, or flex. In the end though, my heart was drawn to the RLT9 variant that had originally prompted my discussion with William: the RLT9 Steel. It’s simply a beautiful version of the frame, made from the perfect material for all day comfort. Yoli was typically forthright in her assessment of my latest madness – and, as ever, she wasn’t wrong. Rather more amazing was that my explanation of why this was such a superb idea did actually make sense to her: I’d be able to sell the alloy frame for mostly what I paid for it; and at current exchange rates the steel version was something of a bargain (effectively $100 less than a US customer could order it for). Even without the added frame features it was compelling – but those extra features would also be invaluable on TCR. There are no fewer than 3 additional points where bottle cages can be fitted: 1 slung under the downtube; and 1 on each front fork leg (doubling as rack mount points). Ideal for rides with long distances between water stops. And then, most importantly of all, we get to the colour. The striking combination of grey and orange may not be to everyone’s taste, but I absolutely love it! In a bizarre and roundabout way, that colour also pulled together another decision I’d been prevaricating over. A dynamo hub served me brilliantly on LEL and PBP. On a ride lasting 4 times as long it would be even more compelling as a way to carry less batteries and remove the worry of keeping them charged up. Despite being so obvious, in the original iteration of Ghost I’d held off from using one. 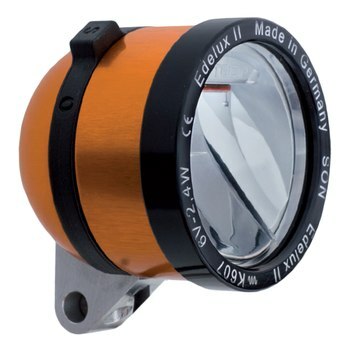 When I looked this time around though, something caught my eye – the updated version of my favourite dynamo light is now available in orange. What clearer indication could there be that it was the right solution for this build? The absence of a fork-crown hole on disc brake bikes poses a small problem for mounting dynamo lights, especially with the likelihood of a crowded handlebar and bar bags obscuring light beams. Enter another piece of cosmic karma around the new frame – with a very cheap adapter, one of those front fork bottle cage braze-ons can be adapted to mount a front light. A quick call to William, and another piece fell into place. The local agents have just started importing HED Belgium rims – an almost perfect strong, all purpose rim for adventure bike use. 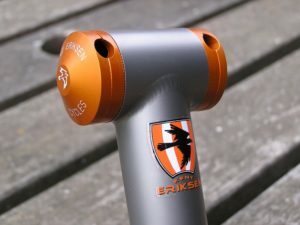 Inevitably, our conversation turned to rear hubs – and Hope Pro4s were the obvious choice (another brand which has been flawless for me on the Ti Burls). 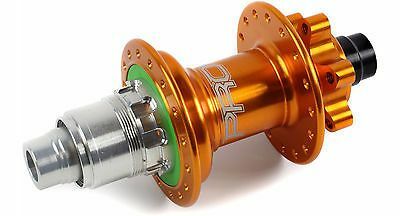 It’s a shame that no one makes a front dynamo hub in orange but, after style consultation with William, we decided this was not a barrier to choosing orange for the rear. It’ll take a few weeks before the new steel frame arrives, so there’s time to debate stem and handlebar choices. For the seatpost, initially, I’ll probably re-purpose the existing Van Nicholas from the Burls, since I have an unused Burls made titanium post that can take it’s place. An alloy post would nullify the comfort gains of the steel frame, and I’m just not confident using a carbon post (however comfortable) with a heavy luggage bag attached. I can’t get the vision of the darned thing shattering on me whilst flying down some descent, shredding my nether regions. On that note though, the existing VN post (and saddle) have seen a lot of kilometers, and so either may be acquiring some hidden points of fatigue. That thought has been sorely tempting me towards the simply sumptuous Eriksen Sweetpost. A crazy extravagance, but of such quality and aesthetic value that one may well find it’s way into my bag on a future US trip. In the early days of my road to PBP, I wrote about bike bones coming together, and all of sudden over the last few days that feeling has returned full force. Despite having only ridden it lightly, I’ve thoroughly enjoyed Ghost – but it’s never felt 100% convincing as being fit for the purpose intended. I have no such qualms though over it’s reincarnated form. This really will be a bike built to survive the rigours of a TCR attempt in comfort, function and, rather surprisingly for me, style too.